Bright red blooms—a favorite of hummingbirds— appear midsummer to fall. Thrives in regular moist soils. 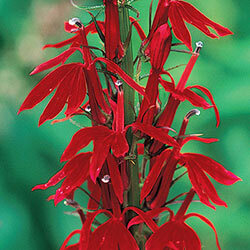 Can be planted along the edges of streams and ponds. 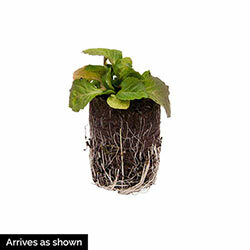 Foliage Type: Dark green, lanceolate serrulate leaves 4" long. Flower Form: Terminal spike - irregular. Bracted raceme. Upperlip is split into 2 lobes, & the lower into 3. The fused stamens form a red tube from which the anthers protrude. Winter Care: Mulch to overwinter. Additional Information: Leaves and fruit considered poisonous.